Primula wenshanensis F.H.Chen & C.M.Hu, Fl. Reipubl. Popularis Sin. 59(2): 291. 1990. Type specimen: Feng 22284 resides at Kunming (holotype) and NAS (specimen NAS00072131). Epithet: Named for the type location. 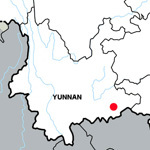 Distribution: Wenshan Xian and Laojunshan, Yunnan.